CLIMB integrates technology and advanced IT solutions (e.g., Internet of Things, Internet of Services, Gamification), placing them in service to the community to provide a more participative, effective and dynamic management of children’s mobility. Smart, wearable devices use proximity sensors to allow the automatic detection of children joining the walking bus and support the automatic completion of the walking bus daily diary. The kilometers travelled by each child using sustainable transportation, e.g., by foot, bike or on the schoolbus, contribute to progress on a virtual, educational journey to places in the real word. Stops along the way allow the discovery of cities, countries, and places, conveying the value of the collective sustainable kilometers travelled to date. 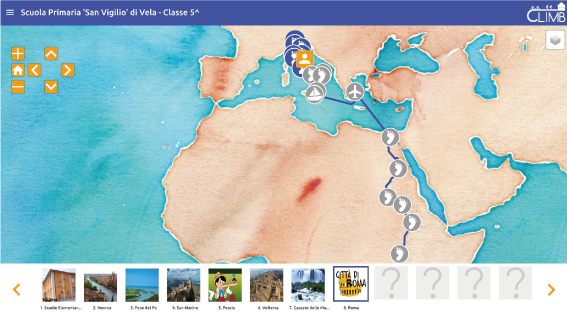 The game is supported by a platform that captures the sustainable kilometers of each child, managing progress in the game and, through a Web App, displaying the achievements on a multimedia, interactive map. 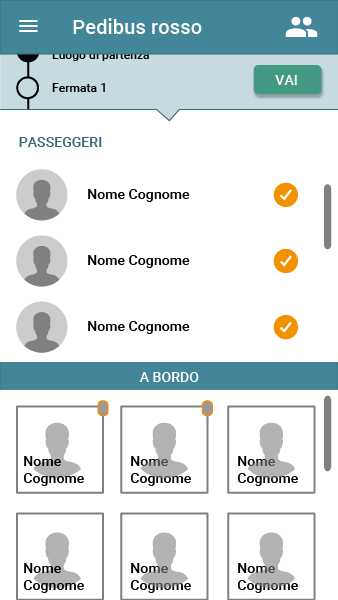 The integration of the App and the “Smart Walking Bus” allows the automatic collection of the kilometers completed by children and volunteers of the Smart Walking Bus. 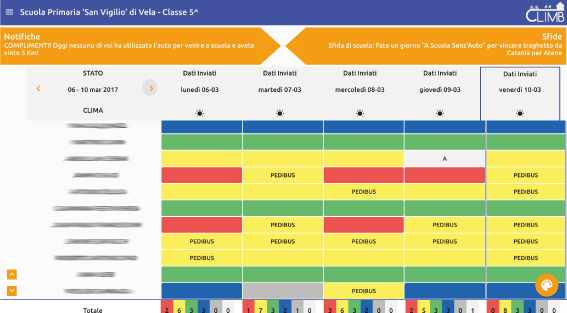 CLIMB solutions are currently used by several schools in the Trento area: 3 “smart walking buses” are running (in Cognola, Meano and Vela) and 11 Kids Go Green games are being played within seven primary schools, for a total of 600 students and 100 teachers. Starting in the 2016/17 school year, the “San Vigilio” primary school in Vela, Italy adopted the “Smart Walking Bus” on three routes. The entire school, a total of 95 children, also participated in a virtual walk with the Kids Go Green game, traveling over 8000 from Vela to their partner school in Kangole, Uganda, giving the children the opportunity to discovery Italy, Greece, Egypt, and many African countries. The Blue Line of the Walking Bus at the “De Carli” primary school in Meano, Italy adopted the “Smart Walking Bus” solution in 2015. A total of 40 children and 22 volunteers were involved in the first experiment, working alongside FBK researchers in the planning and realization of the first “Smart Walking Bus”. Michela Ferron, Chiara Leonardi, Paolo Massa, Gianluca Schiavo, Amy L. Murphy, Elisabetta Farella, che sarà presentato alla conferenza internazionale CHI 2019 (ACM CHI Conference on Human Factors in Computing Systems) in Maggio, ha ricevuto l'honourable mention. CLIMB won the CLIMATE KIC URBAN CHALLENGE - Ferrara (Italy). Urban Challenges initiatives are organized by EIT Climate-KIC with the objective of accelerating European cities' transition to a low-carbon future. CLIMB is one of the seven best practices, among more than 400 submitted projects, selected to represent Italy within the "G7 Transport" in Cagliari, on 20-21 June 2017. Thanks to the CLIMB project, the Comune di Trento received an important national recognition with the award from the “Associazione Comuni Virtuosi” (Associazione of Virtuous Communities) in December 2016, being classified first in the category of “mobilita’ sostenibile” (sustainable mobility).